Electric power planes have made an appearance in recent years. Light free flight above is molded from expanded plastic. Tiny D.C. motor runs off one-shot battery. 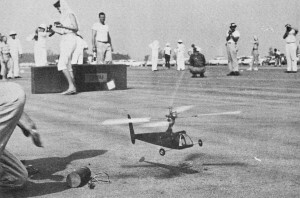 Original design helicopter [above] uses .074 glow engine for power. Flew well. The object of Indoor flying is maximum endurance - and what endurance! The 1960 record stands at 37 min. 32 sec., and this was done with a model having a 44 in. wingspan, weighing .058 oz. (slightly over five one-hundredths of an ounce). Fifteen and twenty minute flights are not unusual in average conditions with most types of indoor models. Thus an indoor model is of superlight construction. The barest outline structures are of 1/64" and 1/32" sq. balsa. Covering is gossamer transparent "microfilm" (resembling cellophane but thinner and lighter). These extremely delicate structures are braced with tungsten or nichrome wire of one one-thousandths inch diameter. Power consists of a single loop of threadlike rubber wound 1,000 to 2,000 turns swinging a propeller having diameter equal to half the model's wingspan. Props are also built-up and microfilm covered like rest of structure. The most incredible aspect of indoor modeling is the slow-motion pace of the entire activity. Models fly at the equivalent speed of a very slow walk. The large props barely tick over and rpm is easily counted visually. The length of the motor run is ideally nearly equal to the flight duration. A flight consists of very slow circling climb to near ceiling contact with gradual circling descent as the rubber motor power slowly diminishes. Because of the extremely delicate structures special carrying boxes must be built to transport an indoor model. Simply opening the box lid takes on the appearance of a slow-motion ritual. Flying conditions inside the hangar or convention hall require that all doors and windows remain closed to prevent even the slightest stray breeze from disturbing the dead-still air desired. Modelers and spectators must move about very, very slowly near the models to prevent turbulence caused by their bodies' motion. An Ill-aimed sneeze can almost destroy an indoor model! Obviously building and flying indoor models requires a high degree of skill and unlimited patience. Indoor addicts are few In number but their dedication is complete. A small but ever-constant part of the model picture since the early 1930's, the activity in recent years has attracted more and more serious-minded advanced modelers. Indoor model types are divided into several classes by A.M.A. regulations. These include both stick and cabin type models, paper and microfilm covered, also R.O.G., hand-launched and R.O.W. There are also categories . for Autogiro, Ornithopter and Helicopter, but these types have very limited interest. Classification is according to area of supporting surfaces: Class A, 30 sq. in. max. ; Class B 30 to 100 sq. in. ; Class C 100 to 150 sq. in. ; and Class D, 150 to 300 sq. in. 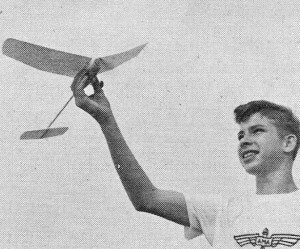 There is also a class for indoor hand-launched gliders having no more than 100 sq. in. area of supporting surface. These are of all-balsa construction like their outdoor counterparts. Because of the relatively small interest in indoor modeling there is no wide selection of kits and supplies as with the more conventional model types. 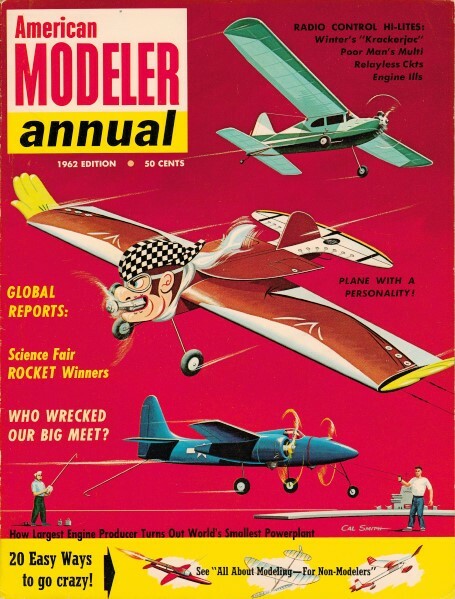 Most models are built from magazine plans and from such sources as the Zaic Yearbooks. Micro-Dyne Precisian Products, 715 East D St., Ontario, Calif., is a supply source and California Model Co. has available a kit for a Class B stick model called the "Featherette." Jetco Models has a simple R.O.G. ideal for introducing the beginner to indoor flying. Jetco also offers hand-launched glider kits.